Bit of shameless self-promotion here about the upcoming “Crucible of Dragons” setting/adventure book (or “A Manual of Exploration of the Island of Pherae” as I’m calling it). If I don’t do it no one else will (OQ2 reviews anyone 😉 ) and its a product that I’m damn excited about getting finished and out to the gaming masses. “Sandbox” gaming is a hip term in Old School Renaissance circles, almost a holy grail in fact. Amongst D100/RQ fans you mention the term and I will guarantee they will shoot back “Griffin Mountain“. This is the classic RuneQuest2 setting were you wandered around a bleak wilderness inhabited by stone age hunters, dinosaurs and chaos monsters and took your rest in one of three citadels riddled with intrigue. 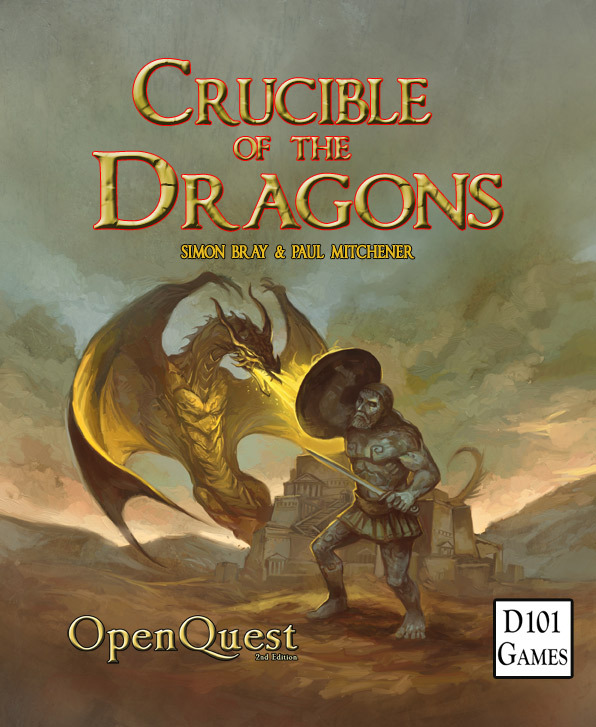 I’ve played it briefly in its Games Workshop published hardcover of the watered down Avalon Hill version which was moved to an island called “Griffin Island”, and as a 40+ player freeform at Tentacles 2006 written and run by Simon Bray (one of the Co-authors of HBD). Its on my list of things to run again before I die. Its a classic go check out its Moon Design reprint. 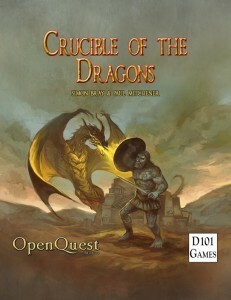 Now Crucible of Dragons, pulls from the creative well that is Griffin Mtn but brings its own take. Its incredibly detailed and rich setting. It has a full Gazetteer, a complete city guide, details both VIP and everyday NPCs, sixteen new cults, ten organisations/factions. The game’s page on D101games.com gives a run down of all the content. One of the things that really impressed me when the first draft hit my inbox, its not your typical “Elves n Orcs” fantasy. In fact there isn’t an Elf or Orc on the island. Dwarfs are there , for secret reasons I won’t go into here, but are re-skinned to a large degree to fit in with the culture and habitat of the island. A race of evil reptilians know as the Dracorians fill the niche of orcs/goblins in a fearsome manner. Simon Bray has done a fine job here creating a truly nasty group of monsters. Demons are also common in the Ancient and deserted ruins of civilisations prior to the current one. 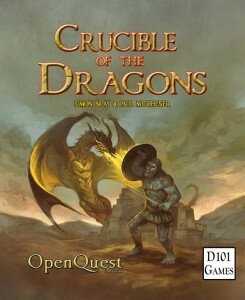 If you are looking for a comprehensive set of rules for demon creation for OpenQuest, Here be Dragons has them. Its scalable and there’s enough going on to occupy Dirtcrawling starting characters looking for a gold piece or two, intrigue for wannabe movers and shakers and enough BIG challenges such as removing Flames of Purity from her throne to occupy characters who have grown to Epic status. 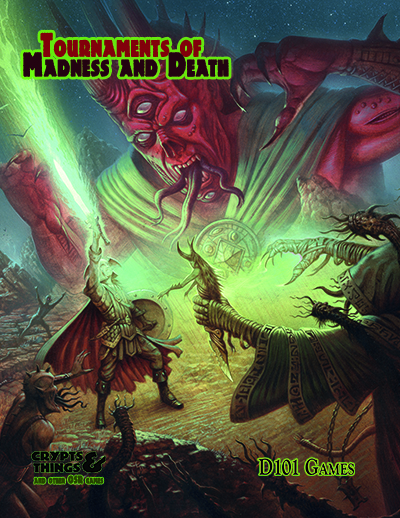 A good 40 pages of the book is dedicated to full set piece adventures, detailed adventure locations and a campaign outline. This is the final piece of the puzzle that introduces new players and Games Masters to the setting and gets you up and running with the island as a Sandbox. Far too many supplements that say they are Sandbox, miss out this bit, and leave you scratching your head looking for an obvious starting point. Overall its Densely packed book full of MGF (MEGA GAMING FUN!) that will give you years of enjoyment. If I had unlimited time and resources I’d do it as a big boxed game. Instead the authors have done a dam fine job of keeping the book within a manageable 140-150 page limit that I set them. Its in it final stages of layout and I’m looking year end/beginning of Jan to get this one released.